Apple has relaxed their water damage policy for the iPod, and this probably includes the iPhone, iPad, and iPod touch as well. This is good news for users who have had experience with a device getting slightly moist from something like fog or rain, but there are certainly going to be limits to what Apple determines is acceptable liquid contact. 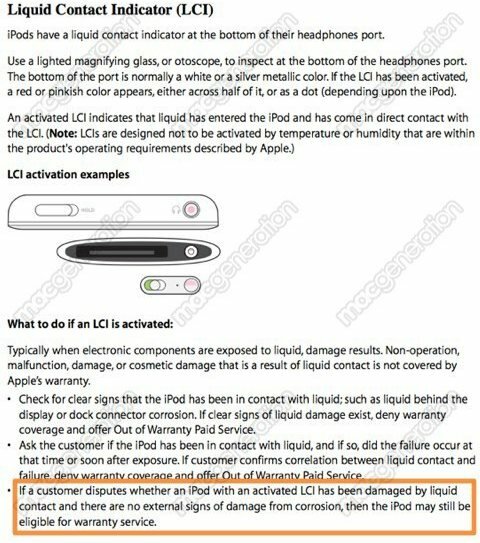 That last line, about a device may be eligible for warranty service, would be particularly welcome to iPhone and iPod users who live in humid climates, who sometimes report the Liquid Contact Indicator (LCI) can be wrongly activated due to extended exposure to high humidity and certain environmental conditions. Of course, this does not allow a deeply water damaged device to get a repair, but ultimately it may depend on a case-by-case basis. For users who have dropped their iPhone into water or otherwise gotten it very wet, you can follow these instructions to try and save the iPhone from water damage on your own. Basically you’re going to need to turn it off immediately and try and dry it out completely before any attempted usage, and it can take a few days for a device to really dry out. Not all iPhones that have suffered serious water contact can be saved, but sometimes they work just fine if you act quick enough. Image of updated policy comes from the French site iGeneration. This is good news, the sensors are very sensitive and will respond to rain despite the iphone still working fine, but that was enough to kill the warranty. I think an internal sensor would resolve this problem too, but might not help with humidity. I had the same experience, must have been rain drop or snow got in the headphone jack and hit the sensor. Apple repaired it anyway but they told me the sensor was triggered and that they see it happen a lot, probably led to the overall policy change. the whole thing is a $$$ thing, it would literally cost 10c to make all these iPods, iPads, iPhones fully water proof but that would take away x% of repeat buyers. How do you figure? Sealing the phone wouldn’t be too practical, how would you deal with the headphone jack..or the dock connector? water resistant head phone jacks and dock connectors do exist. on other devices. but these devices are made by company that is not super rich like apple. super rich companies need to make sure you’ll end up paying more money so they can continue to grow richer. i recently got knocked back warranty on my phone due to this water damage bullexcuse. i’ve already paid the extra over amount to get a replacement. It’s not just humidity, it’s also sweat. In the summer we’ll see a few of these sensors with no other damage or signs of liquid, this is Arizona so it’s just hot and dry.